Desculpe-nos, mas este texto está apenas disponível em Inglês Americano, Espanhol Europeu, 日本語 y Čeština. For the sake of viewer convenience, the content is shown below in this site default language. You may click one of the links to switch the site language to another available language. Please excuse typos or errors. We have only one proofreading. Corrections and help are always welcome. Tomáš Kašpárek our correspondent in Brno, Czech Republic presented weeklyOSM at the SotM CZ+SK. How can new mappers help HOT with the validation process? Read more here. Robert Whittaker visualizes the progress of mapping all defibrillators in Great Britain. In Mapzen’s blog series of targeted editing, Indy Hurts has a focus on cycleway mapping. Joachim suggests a new key prefix scheduled: that would be used for things not in construction yet but planning has been finished. Marc Gemins wonders if digesters shouldn’t be mapped as man_made rather than as a building. User Brogo wants to abandon the tag access=no because he often finds this tag used in a wrong manner. Christoph extends his image service by providing new satellite images for OSM tracing in regions that most other services don’t offer. Read in BushmanK’s diary: “Why copying visual style of paper maps is not a good idea”. Christoph Hormann owner of imagico.de writes in his blog “more on clouds”. He refers to the blog post by RobSímmon from Planet Labs. Many collaborators of Latin-American countries are interested in learning about the Mexican import project of Navicat in order to see how it could be adopted to their countries so they can improve OSM. There will be a video conference about it. Voting about the schedule finished here on May 26th. Brian Hollinshead gives a lecture to the Offaly Historical & Archaeological Society about OpenStreetMap in general and about historical mapping for all. OpenCageData’s interview with Belgian mappers. Pascal Neis’ HDYC got a new feature to display associated accounts and if a mapper may count as verified (e.g. for our malenki). ANSA reports (TODO: Italy-Flag) about the growth and size about OpenStreetMap. Brandon Liu is planning an import of building heights for San Francisco, derived from LIDAR data 2011. German Wikipedia has an article about JOSM since 2008, the English Wikipedia since last week (May 21st 2016). Notability was in question first. The HOT team announced that the 2016 HOT Summit takes place in Brussels, just one day before State of the Map. Registration for the summit is open. Sri Lanka has been hit hard in the past few days by flooding. see all tasks, please help! pay special attention to task 1915. Anecdotal evidence from a Médecins Sans Frontières doctor on a vaccination campaign in the Democratic Republic of Congo: “maps were half the battle“. The New York Public radio station WNYC created an interactive OSM based map representing the income of households in USA (base is the Census 2012). Nicki Dlugash describes the new outdoor style of Mapbox maps. xero.bike will use OSM based maps in their services, provided by Mapbox. The import of borders in Mexico (see lead story in weeklyOSM #304) is greatly appreciated by the Mexican president during an OS conference. See it in the video from 1:08:35 to 1:11:17. The OSM based wheelchair app WheelScout has new features: Indoor Navigation and voice control. After nearly seven years of operation OpenStreetView.org will retire, its developer announced on May 24th. If the users agree, their images will be transferred to a new project by Steve Coast and Telenav which is in development right now. On androidheadlines.com there is an illustrated review about the android app OsmAnd. User mmd reached great results tuning the import speed for Overpass-API, mainly by switching from zlib to lz4. A full attic database import can be done in less than 4 days. User Chris has released an alpha version of his software OffRoad, which is a desktop port of Osmand. He asks for feedback. 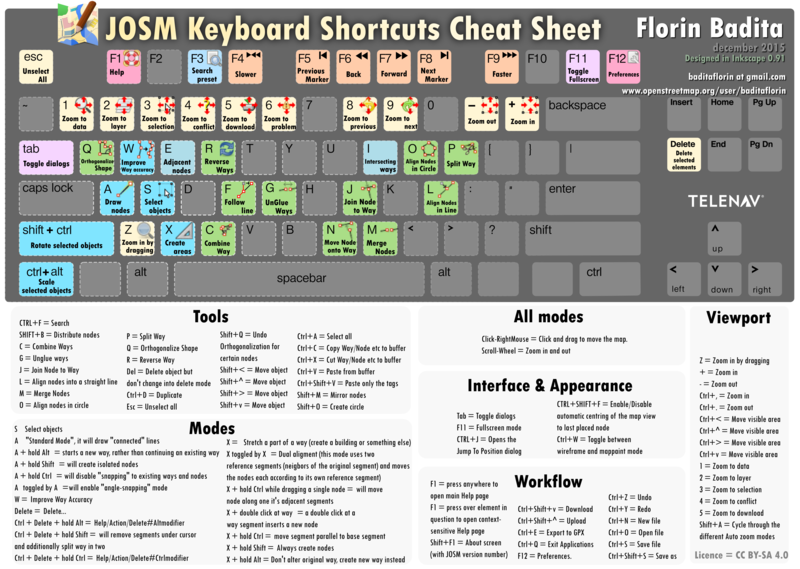 … the JOSM Cheat Sheet? … the almost perfectly mapped Cobras City? The BBC reports on the two-year project “PROTection of European Cultural Heritage from GeO-hazards” (PROTHEGO) – founded by the European Commission – that aims to determine ground movements at European UNESCO World Heritage sites using radar interferometry. GeoHipster interviews Achim and Patrick who are working for SPON about their work as data journalists. Apple opens a maps production unit with 4000 employees in India. INRIX plans to offer in cooperation with US.Parkmobile an end-to-end parking service. The system is based on OSM data. A training “Cartography in OpenStreetMap” takes place on June 08-09 in Rome. This weekly was produced by Hakuch, Laura Barroso, Peda, Rogehm, derFred, jinalfoflia, malenki, mgehling, muramototomoya, stephan75, wambacher.